For the filling, place the sugar and flour in a small pan. Make a well and gradually whisk in the milk to form a smooth paste. Add the butter and stir with a whisk over low heat for 8 minutes, or until the mixture boils and thickens. Remove from the heat, add the essence and yolk and whisk until smooth. Spread into the pastry case and smooth the surface. Beat 2 egg whites until firm peaks form. Add 2 tablespoons of caster sugar gradually, beating until thick and glossy and all the sugar has dissolved. Spoon over the filling and swirl into peaks with a fork or flat-bladed knife. 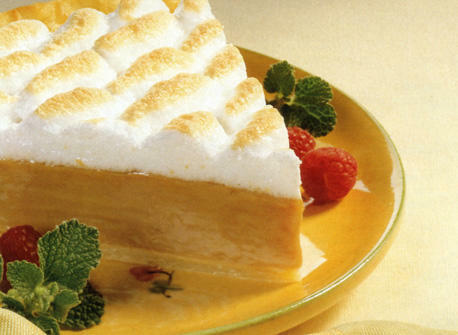 Bake for 5-10 minutes, or until the meringue is golden.